In 1779 the Chapter House on the north side of the Choir was taken down. At the same time Joseph Turner (d.1807) was employed to remodel the choir which was faced with Liverpool stone and from this time ‘no corpse was to be buried within the Choir’. In 1800, with the help of subscribers, the east window was given new tracery and a painted window put in by Eginton. ‘It is really a ludicrous aping of greater things, to see the nave wholly unoccupied, the western lantern arch blocked up, with a solid screen and organ, and by consequence the whole choir choked with seats up to the east end’. ‘There is a sort of double choir, the eastern one being occupied by the congregation whose wants increasing have led to the addition of pew upon pew, till the very alter itself is invaded and scarcely allowed room to exist, while the nave and transepts are comparatively if not wholly useless for any purposes of worship’. Scott’s restoration (1867-75) was thorough and left the interior of the cathedral virtually in its present-day form. The object of the restoration was three-fold. Firstly, it was an attempt to tidy up or re-order the furnishings in order to fully use the Cathedral for worship. Secondly, it was conceived and implemented according to the architectural ideas then prevalent as practised by Scott. Thirdly, it gave the opportunity to enrich the furnishings by the generosity of donors of such items as stained glass windows and other major gifts for liturgical use and other purposes. ‘… it may be briefly described as, externally, new casing the walls, and substituting the characteristic lancets and cornice of the early English period of Edward First’s Cathedral, for the poor and ill-proportioned windows and battlemented parapet introduced during the alterations in the earlier part of the century; and internally, as throwing open the Cathedral, so as to render it available for divine service throughout its entire length from east to west, by taking down the stone screen which separated the choir from the nave, removing the organ, which stood upon it, to the north transept, substituting open seats for the pews which had previously occupied the chancel and seating the nave with chairs’. The floor was paved with rich encaustic tiles inlaid with bands of Anglesey marble. The chancel was raised one step above the choir, and the sacrium four steps above the chancel. The sedilia were restored from fragments discovered in the old work; and the same thing may be said of the two western windows of the chancel, into which the stonework of the originals, found in piercing the walls had been worked up. The east end was given a new dignity with the high alter in the place of honour. The reredos of alabaster was carved by Thomas Earp and represents the procession to Calvary. The east window shows incidents from the life of Christ in medallions, with Christ in glory above. It was erected in 1864 to the memory of Bishop William Carey, (1830-46) and Mary, his wife. The cathedra, or bishop’s throne, is a symbol of the spiritual power of the diocesan bishop. It was placed here, by subscription, as a memorial to Bishop William Beveridge (1704-08); it was designed by Scott. The canon’s stalls, which were moved here in 1932 from their former position under the tower, were designed by William Frankelyn, Master Carpenter of the Counties of Flint and Chester c.1480 in the time of Bishop Redman. They remain the solitary example of canopied stalls in North Wales. Originally there were ten either side, each with corner pinnacles and three crocketed gables. The tip-up seats, or misericords, are all made to one pattern. The stalls have their respective titles inscribed on each; those of the ‘Cursal’ canons retaining the names of their occupants in 1535 – the term ‘cursal’ represents the ‘duty-turn’ of their daily service. Scott designed additional stalls in 1869 these are: the Dean’s stall, given by Mr Price Morris of South Australia in memory of his (supposed) ancestor; Dean Andrew Maurice (1634-60); the Residentiary Stall was given by an anonymous donor, and the two canon’s stalls and canopies by the Reverend Ellis Price. 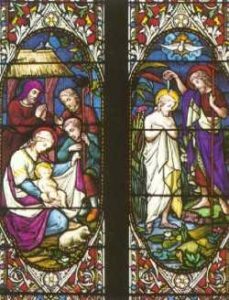 The three-light window on the south side with its six scenes depicting the life of our Lord, is a diocesan memorial to Dean Bonner (1859-86), through whose efforts the Cathedral was restored. A brass memorial, nearby, was given by his family. All the windows in the presbytery (apart from the east window) are by Ward & Hughes of London. ‘Glass began to fall out of the windows of the south transept and cracks to appear in the walls. It was discovered that the massive tower was sinking and beginning to lean over to the south-west. Investigation proved that its foundations were extraordinarily meagre and shallow, merely consisting of rough stones laid on the bed of clay on which the Cathedral rests. The Tower was shored up to prevent further movement and then underpinned by new and much larger foundations, being made of cement with steel rods and girders interlaced. The cracked walls were grouted and the fine transept roofs, formerly hidden by plaster ceilings, were disclosed. When these were opened out it was found that the timbers had been partly riddled by the death-watch beetle and a great number of them had to be renewed’.